If you could straighten your crooked smile easily, would you? Yes, you think, I certainly would, but who wants to wear all that metal hardware? I am just too old for all that. Well, your dentist in Las Cruces at Painted Skies Dental Center has the perfect solution for the reluctant orthodontic patient. Called Invisalign, these clear acrylic aligners fix all kinds of orthodontic problems without the discomfort, long treatment times or obvious appearance of traditional metal brackets and wires. They work well for older teens and adults who have a wide array of smile issues. Chances are you qualify for Invisalign treatment. 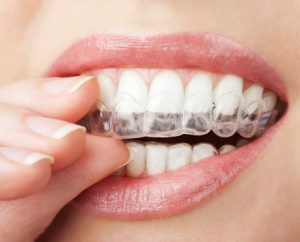 Invisalign clear braces are smooth acrylic aligners that are custom-made to move crooked teeth into positions that are healthier, easier to keep clean and better looking. Instead of two to three years or more of complex and often uncomfortable treatment with metal brackets and wires, Invisalign offers a much faster turn around time (an average of one year), no dietary restrictions and gums and soft oral tissues that are comfortable. While some problems may be too for complex for Invisalign, literally thousands of people across the country qualify annually for treatment as determined by oral examination, digital X-rays and other kinds of imaging. While patients undergo treatment, they need to wear their aligners for 20 to 22 hours per day as specified by Dr. Ortiz. Also, they must remove their appliances while eating and brushing and flossing their teeth. Any minor discomforts resulting from tooth movement quickly resolve. Amazingly, patients report that few people notice that they are wearing any kind of orthodontic appliance. That’s how discreet Invisalign aligners really are. Additionally, Invisalign patients literally eat anything they want. Patients with conventional braces often forego celery. Bagels, nuts and other food options that could break wires or dislodge brackets. Because Invisalign appliances are removable, you can eat the healthy food choices you always enjoy. Then, after treatment is complete, Dr. Ortiz frequently recommends wearing a customized retainer to keep the new Invisalign smile in place permanently. If what you’ve read about Invisalign sounds interesting to you, why not come to the office for a personal consultation? This may be your time to achieve the beautiful smile you have always wanted. Contact Painted Skies Dental Center today.